Set out on an adventurous quest around the ancient lands of Greece, Troy, Phoenicia, Babylon, Egypt, Carthage and Rome to gather the seven greatest powers of the patron god of the Atlanteans, Poseidon. Assemble magic artifacts piece by piece and place them on the Altar of Poseidon to help you raise the legendary continent of Atlantis! 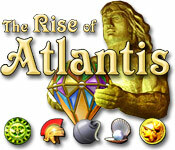 The Rise of Atlantis, with fantastic gameplay and unique twists, will keep you entertained for weeks! The Rise of Atlantis is rated 4.0 out of 5 by 17. Rated 5 out of 5 by grapeleaves from One of my favorits.!!! This is an old game for me. I bought ages ago. The match three are big not many are. After a while you get sick of small things diamonds fishes and such. Try this one for sure you won't be sorry. Rated 5 out of 5 by cheryledz from GREAT Game - Frustrating Game - But do-able I got stuck a few times, but figured out how to get through it. Has a screensaver when you finish!! Also, after you finish, there is more fun!!!!! Very challenging!!! Rated 5 out of 5 by Wendy_HK from Absolutely Addictive I played this game for 7 hours straight when I first got it - I couldn't stop! I had to solve each level there and then. I still find it to be one of the best match 3 games ever! Rated 5 out of 5 by janaj from loved it challenging but fun if you remember to drop the "extras" first! Rated 5 out of 5 by stretchmymind from Relaxing fun. Really enjoyed this game even though it took patience at first. Eventually I got all the way through and have continued to play it for fun for a couple of years now, challenging myself to beat my previous self's scores. Having played it so many times, I have the max lives you can get and plenty of bombs, etc. Swaps are the hardest to get and most necessary towards the end. The story line isn't anything fantastic - just recounting of Atlantis myth. Very enjoyable! Rated 5 out of 5 by LobsterMann from A nice 3 match This is just a nice game. It's really enjoyable and very addictive. Could at points be harder, but the graphics are great, the sounds good, the 3 match fun. Rated 5 out of 5 by reidun70 from all over i liked this game. could be more difecult but a great game. Rated 4 out of 5 by ChristinaX9 from Decent Match 3 Game This is an enjoyable match three game, similar to 'around the world in 80 days' but easier. The reason for this is the sun power up which constantly helps even the novice players to get through levels quickly. There are also many other power ups that you can collect. 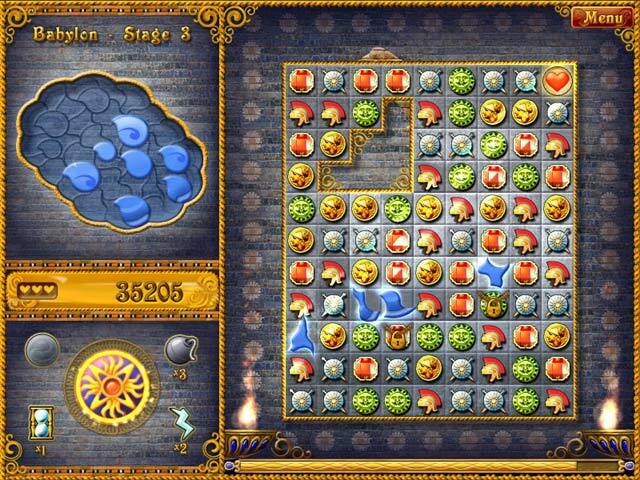 The game is all about collecting pieces from artifacts that fall down the bottom of the board when you make 3 or more matches. The game is good, but I did find it rather easy until the last two countries, but even then anybody should be able to complete it with all the power ups available. Nice for the less experienced player, fun for others too. 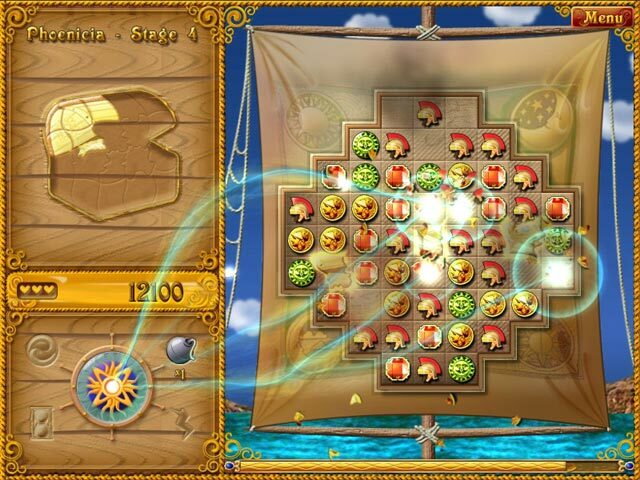 Travel around the ancient Mediterranean and collect all seven powers of Poseidon to raise Atlantis back to the surface.